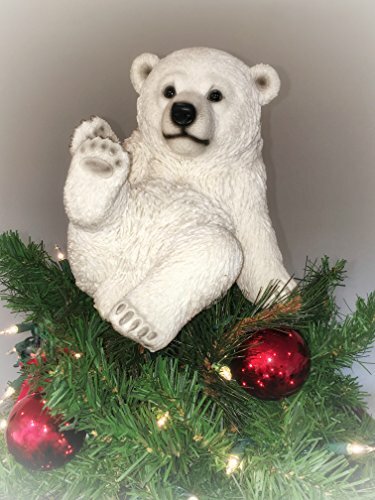 7.75" Real life Playing Polar Bear Sitting Christmas Tree Topper. This playful, real-life looking polar bear automatically will bring a touch of whimsy to your holidays! Measures approximately 7.75"H x 9.5"W x 7.75"D. Shipped along with The Shepherd's StaffTM for easy installation. Designed for artificial trees up to 9 feet tall. Tree topper does not light up. Shipped along with The Shepherd's StaffTM for easy installation. Designed for artificial trees up to 9 feet tall. Tree topper does not light up. If you have any questions about this product by Summit Arbor LLC, contact us by completing and submitting the form below. If you are looking for a specif part number, please include it with your message.